Erbil, Kurdistan Region, Iraq (cabinet.gov.krd) – Prime Minister Nechirvan Barzani received the new Consul General of the Russian Federation to the Kurdistan Region, Mr. Oleg Levin. He gave a brief overview about the political situation in the Kurdistan Region and the current efforts to form the new cabinet of the Kurdistan Regional Government. Consul General Levin commended the KRG for hosting, accommodating, and providing assistance to a large number of IDPs and refugees. He expressed his willingness to further develop bilateral cooperation in various fields. Topics related to the political and security situation in Iraq and the Kurdistan Region in general were also discussed. 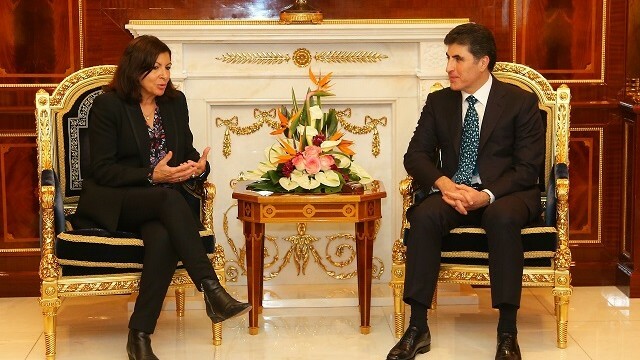 Erbil, Kurdistan Region, Iraq (cabinet.gov.krd) – Prime Minister Nechirvan Barzani received Paris Mayor Ms Anne Hidalgo and her accompanying delegation. She commended the people and government of the Kurdistan Region for hosting, accommodating, and providing assistance to a large number of IDPs and refugees and the effective role of Peshmerga forces in the fight against terrorism, thus contributing to the protection of world security. She also praised the peacefull coexistence among various religious and ethnic communities in the Kurdistan Region. Prime Minister Barzani thanked France and the international community for supporting the Kurdistan Region against ISIS. He said that without such assistance victory would not have been achieved. He stated that the current phase in the fight against terrorism requires the eradication of ISIS ideology. He expressed his thanks to President Macron, who supported the Kurdistan Region politically after the tensions of October 2017, helping d the resumption of talks between the Kurdistan Region and Baghdad, and resolution of some issues. He stressed that the Kurdistan Regional Government promotes the Region’s ancient tradition of tolerance and coexistence among its communities. As example, he mentioned the opening of a new Armenian Church in the Kurdistan Region last week in Erbil, helping also the displaced Armenians who took refuge in Kurdistan to pray in their own church. As the relations with Baghdad start to improve and the economy to recove after the victory on ISIS, Prime Minister Barzani stressed that it is time now to work on development, including adoption of clean energy and environmental protection measures. Erbil, Kurdistan Region, Iraq (cabinet.gov.krd) – Prime Minister Nechirvan Barzani received the Deputy Chief of Mission at the U.S. Embassy in Iraq Joey Hood, U.S. Consul-General to the Kurdistan Region Steven Fagin, USAID Special Representative for Minority Assistance Programs Max Primorac, and their accompanying delegation. The delegation commended the Kurdistan Regional Government for hosting, accommodating, and providing assistance to a large number of IDPs and refugees without discrimination. They stressed the importance of continuation of assistance to all communities who are displaced due to ISIS’ terrorism until personal security and political stability is reasonably assured in their home areas. The situation of the greater region and topics related to economic improvement of the Kurdistan Region were also discussed. Erbil, Kurdistan Region, Iraq (dfr.gov.krd) – Head of KRG Department of Foreign Relations, Minister Falah Mustafa along with the head of foreign missions in the Kurdistan Region participated in the commemoration of the 31st anniversary of the chemical attack on Halabja organized by Ministry of Martyrs and Anfal affairs and Halabja governorate. Head of DFR, Minister Mustafa paid his tribute to the martyrs of Halabja and all the martyrs of Kurdistan liberation struggle and placed a wreath of flower on the memorial of the martyrs. Minister also affirmed to continue the efforts to cover the treatment of the victims of the chemical attack, and delivering more services to the city of Halabja, and with the friends of the people of Kurdistan and the international community to address the Halabja tragedy as Genocide at the international level. He also stressed and called on Iraqi government for necessity cooperation to compensate Halabja people and victims of the genocide, as well as make the city as a symbol of sacrifices and ideal city in the world.